The techniques are the same for Yes No Not Given questions but Yes, No, Not Given texts deal only with the writers opinions, not facts. Key point: There are no traps or tricks to these kinds of tasks, IELTS is testing your language and not trying to trick you. Make sure you are using authentic Cambridge IELTS materials.There is a lot of material out there on the internet that is fake and just leads to confusion. 1. What exactly is True, False, Not Given?. 2. Tips and Strategies for this type of question. 3. Example of True, False, Not Given questions. 5. Example text and analysis. What exactly does “True, False, Not Given” mean? True = The statement agrees with the information in the passage. False = The statement contradicts or is opposite to the information in the passage. Not Given = There is no information in the passage and there is no way to know. Key Point: if the information in the text is similar or close in meaning then it is not true, TFNG only deals with facts, not maybes or similarities. It is also important to know what Not Given means. If it is impossible to find the information in the area of the passage then it will be Not Given. Tips and strategies for this type of question. 1. The answers usually (not always) come in order in the passage. This means that the answer to question one will be around the first paragraph and the answer to question two comes after that and so on. This is not always the case though. 2. Look out for questions with names of people, places and also numbers, this type of answer will be easier to find in the passage. 3. Be careful with adverbs of frequency (often, sometimes, occasionally, usually, mainly etc..) this can change the meaning… for example: “I usually go to the gym on Saturday” is very different to “I occasionally go to the gym on Saturday” . Look out for phrases like ‘all, some most, the majority, many’. 5. Before reading look at the title of the passage first, then briefly scan the passage to get an idea of the topic or theme. This should not take more than 1 minute. Then look at question one, read it carefully. underline key words then skim the area of the passage (paragraph 1) to locate where the answer could be, then most importantly, read in detail only in the area that you feel the answer could be. Most students do not read in detail and this is where problems happen. 6. Do not just look for matching words, look for synonyms and collocations and as mentioned before, read the area you feel the answer could be in more detail before answering the question. Tip: You have to match the meaning, not just single words. 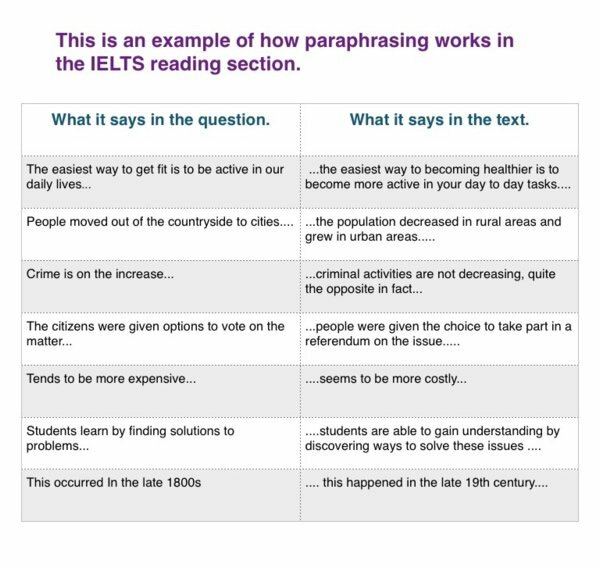 Paraphrasing is also a key part of the IELTS test and it also shows up in the reading section, therefore you really need to have good vocabulary to tackle the reading section. Take a look at some examples below. Example of True False Not Given Questions. 3. 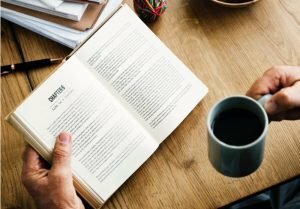 Focusing on keywords and then trying to match them – you have to think of how the words from the question are paraphrased and the way synonyms are used. Most often the words used in the questions are different to that in the text. 4. Thinking that you have to be an expert on the topic -or needing to understand every single word, sometimes you will not understand technical words but you can get a good idea of the meaning by guessing meaning from context. Take a look at this Youtube lesson which explains this technique here. 5. Not fully understanding the statement. You need to understand what the question or statement asks, this is why your vocabulary has to be good before approaching this exam. Statement: Chronobiology is the study of how living things have evolved over time. 2. Statement: The rise and fall of sea levels affects how sea creatures behave. 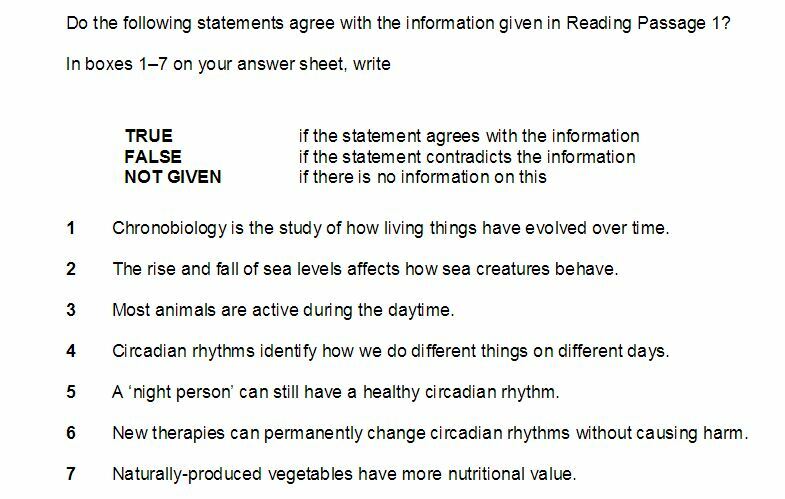 Answer: True – The passage says “Marine life is influenced by tidal patterns…” this is a good example of how paraphrasing works: sea creatures = marine life / affects = influenced by / sea levels = tidal patterns. 3. Statement: Most animals are active during the daytime. Answer: Not Given – I can’t find anything in the passage about most animals being active during the daytime, only that ” Animals tend to be active or inactive depending on the position of the sun.. ” or ‘ numerous creatures like to come out during the hours of sunlight..’ but this doesn’t answer the question clearly also “Nocturnal animals” which are animals that come out at night and “crepusuclar…..low light of dawn and dusk….” there is no information about most animals being active during the daytime … simply not given.